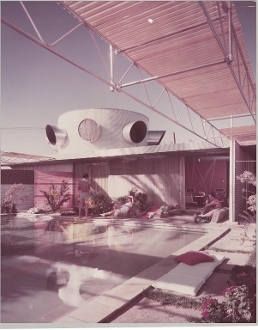 Albert Frey's personal residence with corrugated fiberglass sheltering the pool area. The second story circular bedroom was added during the 1953 remodel. Chromogenic print: Unframed print size: 16" x 17" (40.64 x 43.18 cm.). Image is in Excellent Condition. Condition Report: Any condition statement is given as an opinion and does not imply that this photograph is in perfect condition or completely free from wear and tear, imperfection or the effects of aging. 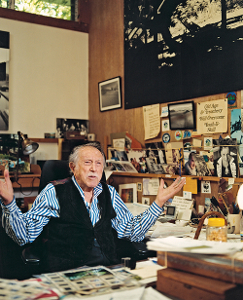 This Julius Shulman image came from Shulman's Hollywood Hills studio.